Southern Shutter manufactures fine quality exterior and interior shutters. The time tested construction methods of Mortise & Tenon are used to craft Interior shutters that are as strong as they are beautiful. Southern Shutter Company offers a complete line of exterior products including a variety of Western Red Cedar Gable Ventilators and Multi-Wood Species shutters. 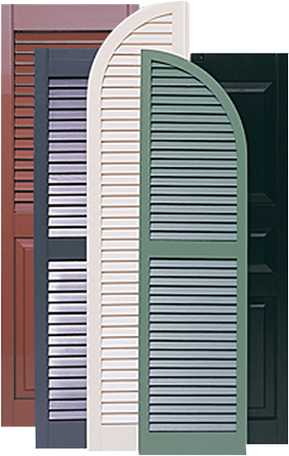 All Exterior louvered shutter lines can be crossed with their sister paneled shutter to create custom variations of exterior combination shutters. Exterior wood shutters have a timeless appeal. Time adds characteristics to wood shutters that cannot be simulated by synthetic products. As a wood shutter ages, the elements wear, the paint layers build, and each shutter takes on a personality of its own, giving a home unique character. Southern Shutter's interior Movable Louver shutter is available in four louver widths. The strong Mortise & Tenon construction method enables the creation of large panels that dowel construction cannot provide. Southern Shutter's movable interior line uses their UV prime, multi coat priming process to give the smoothest finish possible, allowing the shutters to be finished with minimal prep work.